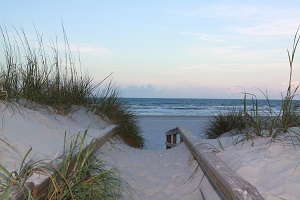 New Smyrna Beach stretches along 13 miles of white sandy beach. It is a laid- back coastal community for those who visit or call this quaint town their home. It's an ideal blend or outdoor recreation, shops, marinas, restaurants and a thriving arts district free of large crowds and noise. The city is bordered on the south by the Canaveral National Seashore Park and on the east by the Atlantic Ocean. It has great dining, surfing, art and history. Edgewater is nestled along the Indian River Lagoon with a variety of nature and wildlife. Edgewater's inviting personality and small town charm has earned it the name "Hospitality City" . Today, the boat building industry is a large part of the business in Edgewater. It is the center for manufacturing in Southeast Volusia. Oak Hill is a small community that borders the Canaveral Seashore Park, neighbors the Indian River Lagoon and is the second highest elevation in Florida. Oak Hill holds the smallest population of the three communities whose residents enjoy it's secluded lifestyle. The town was appropriately named for its many grand Oak trees draped in Spanish moss that give it a unique charm all its own. A visit here will uncover several Timucuan Mounds that are evidence of past generations who lived here. Includes Cities/Towns: Edgewater, New Smyrna Beach, Oak Hill. Along with many fishing and surfing tournaments and deep sea fishing. Canoe, kyack and paddleboards are available for tours or individual use. We also have a Kite Festival, 5K Runs, Golf tournaments, historical events, Art & Wine Walks and many specials events most weeks on Canal Street and Flagler Avenue. There is a very active "Little Theater". If you cannot find something to do, you haven't looked hard enough. We have the world reknowned Atlantic Center for the Arts, The Artist's Workshop and The Hub, which are very active art scenes. Concert in the Park are held every summer along with a yearly Jazz Festival. Several small concerts on Canal Street and Flagler Avenue during the year. There is an Historical Museum, Surfing Museum and a Marine Discovery Center. Lectures are held regularly at the local library and the Discovery Center. There is a very active theater group. Several fine arts and crafts festivals are held throughout the year. Take advantage of countywide public transportation bus system VOTRAN that can be called for personal pickup at home. There are several taxi services in town and we enjoy a small local airport and are close to Daytona Beach International Airport and Sanford/Orlando Airport. Jan 47.6 F° 58.7 F° 69.8 F° 3.0 "
Feb 49.2 F° 60.3 F° 71.3 F° 2.7 "
Mar 54.2 F° 65.0 F° 75.9 F° 3.8 "
Apr 58.4 F° 69.2 F° 80.0 F° 2.6 "
May 64.9 F° 75.0 F° 85.2 F° 3.4 "
Jun 70.8 F° 79.9 F° 88.9 F° 5.8 "
Jul 72.6 F° 81.8 F° 91.1 F° 5.6 "
Aug 72.9 F° 81.6 F° 90.3 F° 6.3 "
Sep 72.0 F° 80.0 F° 88.0 F° 6.6 "
Oct 65.5 F° 74.1 F° 82.7 F° 4.5 "
Nov 57.4 F° 67.2 F° 77.0 F° 3.1 "
Dec 50.6 F° 61.1 F° 71.6 F° 2.7 "
Summers are hot and it is our rainy season. We are very fortunate not to be an active hurricane or tornado area. Winters are usually pleasant and sunny during our dry season. Condos Over 50 Communities We have various selections of housing. Something for everyone. On the beach or riverfront, ocean or river views or on the mainland. Home care Senior center Visiting nurses We have a wide variety of services for seniors and handicapped individuals. As well as home health care. There is a Council on Aging with a very active lunch program as well as Meals on Wheels. Jobs are mostly in the hospitality areas, hotels, condos , restaurants etc. Along with Real /estate, boat building and other manufacturing companies. Volunteering in available in the arts, medical, libraries etc.